UPDATE: Looks like United has put their fares back up this morning. Flights from Toronto to Dallas, Texas tend to bottom out in the range of the low $600s (roundtrip after taxes). So it's noteworthy that United just loaded some fares for 55% cheaper than that typical bottom. ^^ Important, click the calendar icon to see the cheap date combos. I get the feeling some of you are missing this step. 3. Click on the outbound flight, and then the return flight, and then click on 'book with United'. UPDATE: Looks like they just dropped a little further, down to $245. toronto, yyz, flight deals, united states, united, dallas, texas and dfw. 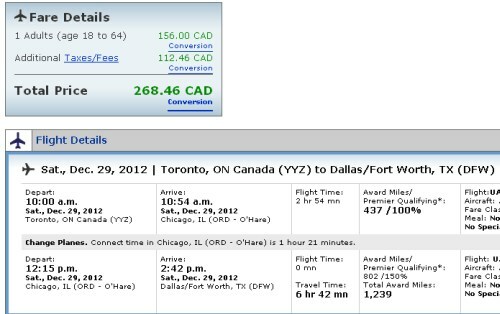 15 Responses to "Toronto to Dallas, Texas - $268 roundtrip after taxes"
I think it may have been a glitch? Can't seem to recreate the fares. Really appreciate your work though, Chris! Just tried, and can verify the price just fine. What dates were you trying? Seems gone already. Thanks Chris, great work! What dates are you guys looking at to see the deal? For those that can't see it, are you following the steps in the blog post? If so, list the dates you're not having any luck with. What dates Dino? All the random dates I've tried so far have verified at $260ish when clicking over to United. I think its when trying to book two fares. when I try to book one person it works. it works now! Thanks, Pal. I may hit Dallas for fun even though I was there just over a month ago.. $266 smoked BBQ is well worth it!! No problem! Agreed about the smoked BBQ!